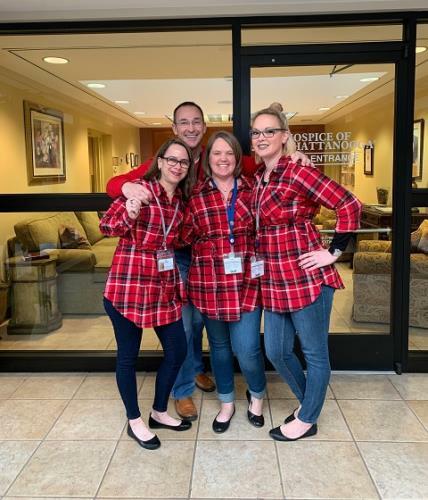 Hospice of Chattanooga staff and volunteers wore red last Friday in celebration of National Wear Red Day 2019, part of the American Heart Association’s 15-year-old Go Red for Women heart disease awareness program that kicks off American Heart Month. The month long awareness campaign coincides with the unveiling of Hospice of Chattanooga’s Heart Journey Program, a new initiative designed to maximize the quality of life for end-stage cardiac disease patients and their loved ones. Since its launch last fall, the program has treated 23 patients in the comfort of their own homes, with none of them going back to the hospital. “One in three women lose their lives to cardiovascular disease, although nearly 80 percent of cardiac events can be prevented, according to the American Heart Association. Hospice of Chattanooga proudly recognizes National Wear Red Day to raise awareness of this threat, especially to women. We also want to acknowledge the compassion and dedication of our staff, volunteers and counsellors in helping terminal cardiac patients find peace and dignity as they face their end-of-life journeys at home,” said Tracy Wood, president and CEO of Hospice of Chattanooga. The Heart Journey Program addresses the medical, psychosocial and spiritual needs of end-stage cardiac patients and those of their loved ones through education, support and treatment. “We cannot overstate the need for such an essential hospice program like Heart Journey in our community. Patients experiencing the terminal stages of cardiovascular disease may suffer from a host of painful and disruptive symptoms as they approach the end of their lives,” said Dr. Greg Phelps, chief medical officer of Hospice of Chattanooga. The Heart Journey Program offers its patients 24-hour access to a Hospice of Chattanooga nurse seven days a week and a daily assessment by visit or phone. The program provides all necessary cardiac medications and a comfort kit to help patients manage pain, swelling and anxiety in their homes. Eligibility for the program includes a number of critical conditions, especially Class 4 heart failure, in which the patient cannot undertake any physical activity without discomfort and suffers from symptoms even while resting. Patients experiencing cycles of weight gain or loss, swelling of abdomen or limbs, anxiety, weakness, fatigue, shortness of breath and other increasing symptoms may also be eligible for hospice care. End-stage patients who suffer from pulmonary disease, diabetes, hypertension or renal disease may also be eligible for the Heart Journey Program, as may those with histories of cardiac arrest or unexplained losses of consciousness due to drops in blood pressure. Referrals are accepted by calling Hospice of Chattanooga at 423-892-1533. The goal of the Heart Journey Program is to admit all eligible patients within three hours of receiving the referral.